The staff of the Upper Midwest Telehealth Resource Center (UMTRC) are extremely excited for our very first Annual Conference. Since the inception of the UMTRC in 2011, we have worked with countless telehealth programs in our region. Telehealth has grown from a innovative idea for patient care to more universally accepted way of providing healthcare when distance becomes a barrier between patients and providers. 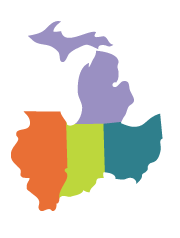 The UMTRC 2019 Annual Conference will showcase successful telehealth programs from each of the four states in our region: Illinois, Indiana, Michigan, and Ohio. We will also have representation from the Great Plains Telehealth Resource and Assistance Center (GpTRAC) and the Telehealth Technology Resource Assessment Center (TTAC) who serves as the National Technology Resource Center. The conference is being held at the infamous Gillespie Conference Center on the college campus of St. Mary's College in South Bend, Indiana, which is located adjacent to the Notre Dame campus. Starting with a pre-conference session from 1pm to 4pm on Tuesday, July 23rd, participants will have the opportunity to choose between two tracks: Telehealth 101 or Broadband and Data. The Telehealth 101 track will include an Introduction to Telehealth, presented by Doris Barta from TTAC; Videoconferencing Essentials, presented by Dr. Jonathan Neufeld from GpTRAC and co-founder of the UMTRC; and a Telehealth Technology Showcase, presented by Jordan Berg from TTAC. The Broadband and Data track will include a Broadband Introduction, presented by Ally Orwig from the Indiana Rural Health Association; Blockchain: A Primer for Healthcare Executives, presented by Jeana Singleton from Brennan, Manna, and Diamond, LLC; and Security and Cyber Risk presented by Ron Peltier & Allison Nordembrock from Pondurance. Tuesday from 4pm to 4:30pm, participants and exhibitors are encouraged to enjoy a stroll on either the St. Mary campus or the Notre Dame campus. An evening reception from 5pm to 7pm rounds out the day with light hors d'oeuvres and a chance to network with our exhibitors. Wednesday will be a full day, starting with a Fun Run/Walk at 6:30am. Registration and breakfast begin at 8am, with the Welcome and opening session at 9am. Our Keynote this year is entitled 'The Justice League of Telehealth: Smashing Barriers, Leaping Hurdles' presented by Michelle Hager from Blue Cirrus. Eight additional breakout sessions round out the day, with plenty of networking time built in to meet your peers from around the UMTRC region. Registration is now open for attendees and exhibitors on the UMTRC website.